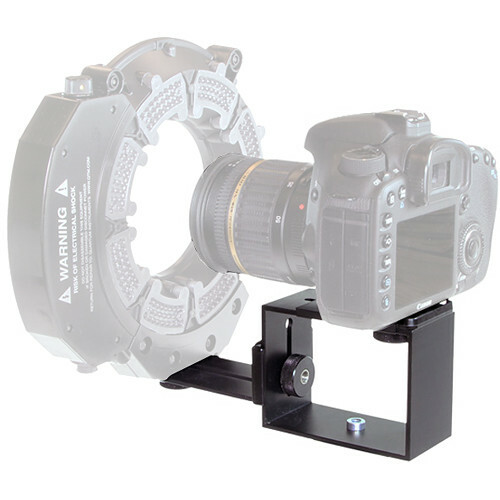 The QF29 Omicron Mounting Bracket for Ring Light from Quantum Instruments is an adjustable rectangular bracket that attaches to any Omicron ring light and a DSLR or video camera--enabling you to use the light for photo or video capture. The camera attaches to the top of the bracket by mounting onto a 1/4"-20 screw with a thumbwheel; this screw goes through both the bracket itself and a mounting plate, which helps align the camera properly. The ring light attaches to the extension arm, which connects to the bracket via the slot on the front and features a thumbwheel for height adjustment. Additionally, the bracket is equipped with a 1/4"-20 threaded female tripod socket. The QF29 is constructed from aluminum alloy for durability and light weight. Box Dimensions (LxWxH) 12.6 x 3.9 x 3.4"
QF29 Omicron Mounting Bracket for Ring Light is rated 5.0 out of 5 by 1. Rated 5 out of 5 by Robert from Big Improvement The QF29 bracket for the Omicron ring light from Quantum is a BIG improvement over the original bracket. The old bracket was less rigid and difficult to adjust for tall cameras, with battery grip or Quantum Turbo Blade battery. The new box structure provides the rigidity, and the ring light arm is simply turned over for tall camera setups. The new bracket is also more comfortable for hand-holding. Good investment.